In the northeast of the country, the sandstone Ennedi Massif has been sculpted by water and wind erosion over time into a plateau featuring canyons and valleys that present a spectacular landscape marked by cliffs, natural arches and pitons. In the largest canyons, the permanent presence of water plays an essential role in the Massif's ecosystem, sustaining flora and fauna as well as human life. Thousands of images have been painted and carved into the rock surface of caves, canyons and shelters, presenting one of the largest ensembles of rock art in the Sahara. 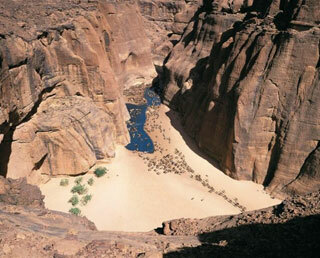 This article uses material from UNESCO World Heritage List article "Ennedi Plateau", which is released under the Creative Commons Attribution-Share-Alike 3.0 IGO License.